Hilary, Bishop of Poitiers, was a prolific writer on Scripture and doctrine, an orator, and a poet to whom some of the earliest Latin hymns have been attributed. Augustine called him “the illustrious doctor of the Churches”. Jerome considered him “the trumpet of the Latins against the Arians”. For his defense of the Nicene faith, he is also known as “the Athanasius of the West”. Hilary (Hilarius) was born in Pectavus (later Poitiers) in Gaul, about 315, into a pagan family of wealth and power. In his writings, he describes the stages of the journey that led him to the Christian faith. He was baptized when he was about thirty years old. In 350, Hilary was made Bishop of Poitiers. Although he demurred at first, he was finally persuaded by the people’s acclamations. He proved to be a bishop of skill and courage. 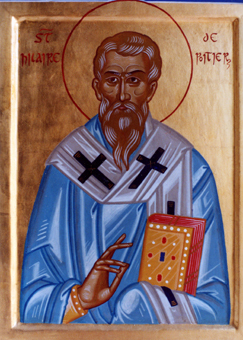 His orthodoxy was shown when, in 355, the Emperor Constantius ordered all bishops to sign a condemnation of Athanasius (the bishop of Alexandria, champion of Nicene trinitarianism against the Arians), under pain of exile. Hilary wrote to Constantius, pleading for peace and unity. His plea accomplished nothing, and, when he dissociated himself from three Arian bishops in the West, Constantius ordered Julian (later surnamed the Apostate for his conversion to Neoplatonic paganism) to exile Hilary to Phrygia. There Hilary remained for three years, without complaining, writing scriptural commentaries and his principal work, De Trinitate (On the Trinity). Hilary was then invited by a party of the semi-Arians, who hoped for his support, to a council at Seleucia in Asia, largely attended by Arians; but with remarkable courage, in the midst of a hostile gathering, Hilary defended the Council of Nicaea and its definition of the Trinity, giving no aid to the semi-Arians. He wrote again to Constantius, offering to debate Saturninus, the Western bishop largely responsible for his exile. The Arians feared for the outcome of the debate and persuaded Constantius to return Hilary to Poitiers. In 360, Hilary was welcomed back to his see with great demonstrations of joy and affection. He continued his battle against Arianism, but he never neglected the needs of his people. Angry in controversy with heretical bishops, he was always a loving and compassionate pastor to his diocese. Among his disciples was Martin, later bishop of Tours, whom Hilary encouraged in his endeavors to promote the monastic life. O Lord our God, you raised up your servant Hilary to be a champion of the catholic faith: Keep us steadfast in that true faith which we professed at our baptism, that we may rejoice in having you for our Father, and may abide in your Son, in the fellowship of the Holy Spirit; who live and reign for ever and ever. Amen. The propers for the commemoration of Hilary, Bishop of Poitiers, are published on the Lectionary Page website.